WASHINGTON - A 19-year-old pickup truck driver involved in a deadly highway pileup in Missouri last year sent or received 11 texts in the 11 minutes immediately before the accident, federal investigators said Tuesday. The driver sent six texts and received five texts, with the last text just before his pickup crashed into the back of a tractor truck, beginning a chain collision. 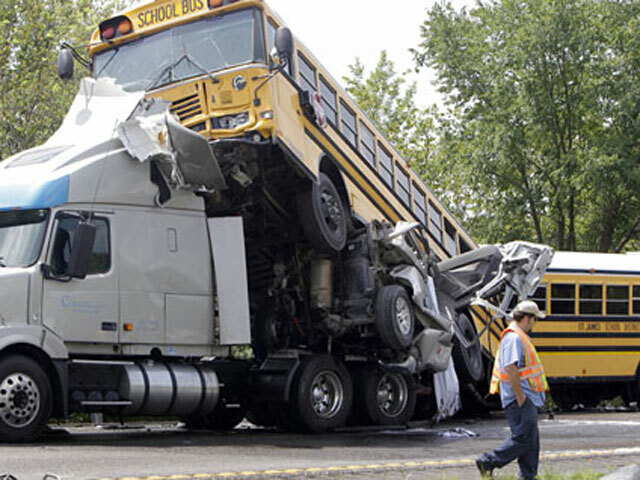 The pickup was rear-ended by a school bus, which in turn was rammed by a second school bus. The accident is a "big red flag for all drivers," National Transportation Safety Board chairman Deborah Hersman said at a meeting to determine the cause of the accident and make safety recommendations. As a result of the discoveries about the accident, federal accident investigators are recommending states ban the use of cell phones and other electronic devices by all drivers except in emergencies. The board doesn't have the power to impose regulations, but its recommendations are heavily considered by lawmakers. The board has previously recommended bans on texting and cell phone use by commercial truck and bus drivers and beginning drivers, but it has stopped short of calling for a ban on the use of the devices by adults behind the wheel of passenger cars until today. The agency takes an annual snapshot of drivers' behavior behind the wheel by staking out intersections to count people using cellphones and other devices, as well as other distracting behavior.